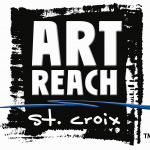 ArtReach St. Croix is taking a touring exhibition to NEA Big Read in the St. Croix Valley library partners beginning in March. 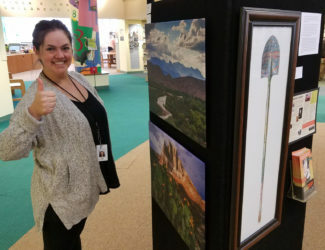 The “Art on Tour…” installation began its journey at the River Falls Public Library on Monday, March 12. Visitors to the libraries will have an opportunity to see work by photographer David Owen and painter Jimmy Longoria. Owen’s panoramic photographs show the expansiveness and beauty found along United States border with Mexico in western Texas. Also on display will be a print of one of Longoria’s “Palas de mi Apa,” a painted shovel he has painted to honor Latino and minority leadership in the United States. Minneapolis-based photographer David Owen used to live on the Texas/Mexico border in an area called the Big Bend. His panoramic photographs characterize the remoteness of much of the border with its austere, desert beauty. Along with his landscapes, David is known for portraits and commercial work for weddings and other life events. Born and raised on a farm in South Texas, Jimmy Longoria studied at the School of the Art Institute of Chicago and Pitzer College in Claremont, California. He has honed his talent and forged a vision of giving back to the community through art. Jimmy lives and works in Stillwater. He is the only Minnesotan to have art in the permanent collection of Chicago’s National Museum of Mexican Art, the largest collection of Mexican Art outside Mexico. He is a Bush Foundation Artist Fellow. Jimmy’s art hangs in the offices or homes of Supreme Court Justice Sonia Sotomayor; Former Secretary of Housing and Urban Development Julian Castro; Representatives Luis Gutierrez and Keith Ellison; collector and actor Cheech Marin; as well as museums, schools, private and corporate collections. Longoria offers an original pala (Spanish for “shovel”) to people of major accomplishments, predominantly those with Hispanic heritage. A pala is a common farm tool, but Longoria’s artistic interpretation changes them into a symbol of honor. He came up with the concept from a story about his grandfathers, who were farmers in South Texas. Migrant workers would come to the farm when the workers left, there were often shovels missing as well. His grandfather came up with the idea of marking the shovels with paint to identify them as his property. Longoria remembers watching these proud men with their painted shovels, now symbols of unification and community.